Welded Wire Facing Units (WWF) are used to show vegetation of a near vertical slope, or sometimes are used as the reinforcing structure of an MSE Panel Retaining Wall. For vegetation growth, erosion control blankets are wrapped at the face of the basket as it is filled with topsoil-like material. 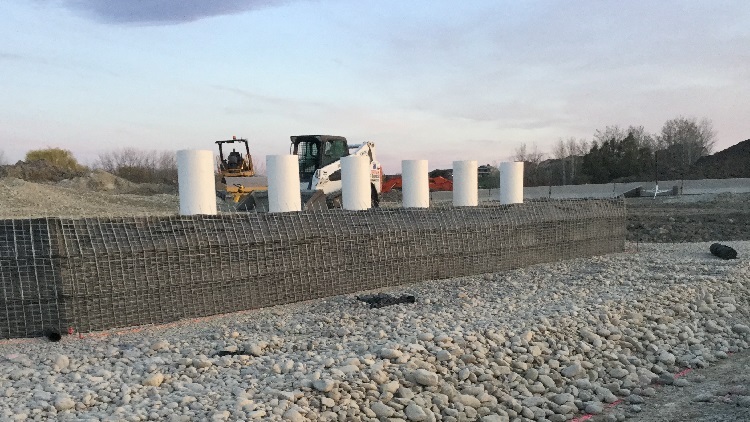 For MSE Panel installation that covers the face of the WWF wall, heavy-duty filter fabric is used to support the structural soil fill within the baskets. Every basket course is reinforced with geogrid (typical to a regular segmental wall) at a depth structurally designed by the wall engineer of record.